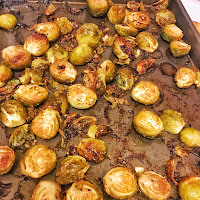 This is an easy side dish that can be made in a small batch for dinner or a much larger batch for a week of meal prep, they are delicious hot out of the oven, cold or reheated. I used Brussels sprouts but you can toss most green vegetables in this mixture and roast them for a healthy side dish packed with flavor. Preheat your oven to 350 degrees. Line a baking sheet with foil, this makes for a much easier clean up. Trim Brussels sprout ends and cut them in half. Place sprouts in a bowl with the zest and juice of the lemons, the pressed or minced garlic, and olive oil. Season with salt and pepper and mix until all sprouts are fully coated. Add sprouts to lined baking tray and bake at 350 for about 15 minutes, stir and bake until the edges begin to get brown and crispy, approximately 15 more minutes. A fun addition is to toss them with parmesan cheese when they come out of the oven, you can take a simple week night side dish and turn it into a holiday side. This recipe also works wonderfully with broccoli or asparagus.